Can I Get Caverject over-the-counter or on the NHS? Or online? Can I Get Caverject OTC? Or on the NHS? Where can I buy Caverject? Is it available over the counter? Or on the NHS? Caverject is a prescription-only medicine, so can’t be purchased over the counter. Branded medications for erectile dysfunction are only provided on an NHS prescription in certain cases; so for the most part, patients will need a private prescription in order to be able to get Caverject. 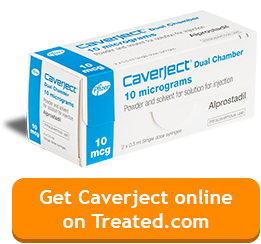 It’s possible to buy Caverject online; although this isn’t recommended if you haven’t used the treatment before, or been shown by a doctor how to use it. You can also get Caverject through your NHS GP, however private prescription fees may apply. The prescription they issue can then be fulfilled at a local or high street pharmacy. On this page, we’ll explain how you can get Caverject, and who may be entitled to it for free on the NHS. If you have erectile dysfunction, speaking to your GP in the first instance is generally recommended. In some cases, an underlying health issue can be the cause; and a doctor can conduct tests to try and identify these. In some cases, they may refer the patient to a urologist for further examination. During consultation, a doctor will typically ask you some questions about your health and lifestyle. Sometimes, ED symptoms can be the result of alcohol consumption, smoking or being overweight. It’s possible for some men to overcome symptoms by addressing these factors. If anxiety or stress is contributing to your symptoms, then they may talk to you about these too. Again, discussing these issues can help to reduce the severity of symptoms. If your GP thinks that treatment is the best option, then they will usually recommend oral tablets, such as Viagra and Cialis at first. If for any reason these aren’t suitable (such as if you have a medical condition which prohibits you from using them, are allergic to anything in the tablet, or are taking another treatment which is a contraindication) then they may suggest an alternative. or had an injury involving the spinal cord. As there is no generic version of Caverject at present (although there are other branded versions such as Viridal), men who do not meet the above criteria will usually have to pay a private prescribing fee when getting it from their NHS doctor. Once your prescription for Caverject has been issued, it can be fulfilled at a pharmacy in person. Men who are entitled to branded treatments on the NHS will not have to pay for their medicine when they pick it up. Otherwise, you’ll have to pay the market price for the treatment. This is likely to be significantly more than the NHS levy rate. Unlike some oral treatments, where you can consult with a prescriber in the pharmacy, you won’t be able to get a prescription for Caverject from your pharmacy. Before first use, a doctor or nurse will have to show you how to apply Caverject. Caverject is available to buy privately online. Some online pharmacies fulfil prescriptions issued by GPs; whereas some have a service where they can issue a prescription. This typically involves consultation with a doctor or registered prescriber. Patients will provide answers to an online health assessment, which are then reviewed by a GP. If the medication is suitable, then the GP will issue an e-prescription and send this to the pharmacy to be fulfilled. The prescription will then be dispensed at the pharmacy, before being delivered to the patient. 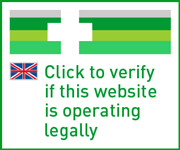 Whenever you buy treatment online, you should only use sites registered with the General Pharmaceutical Council, which is the UK regulatory body for pharmacies. For more on this subject, head over to our page on safe buying practices. Remember that Caverject is not available over the counter and cannot be obtained without a prescription; so any site offering to provide it without a prescription should be avoided. You can read more on our page on how to avoid buying fake Caverject.